DEXA (Dual Energy X-ray Absorptiometry) exams estimate the amount of bone mineral content in specific areas of your body. 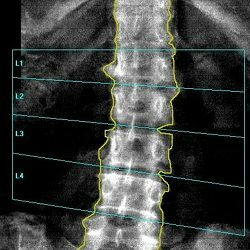 Two X-Ray energies allow the Radiologist to tell the difference between bone and soft tissue, giving a very accurate estimation of bone density. DEXA is painless, and requires no injections, invasive procedures, sedation, special diet or any other advance preparation. During a DEXA exam, the patient lies fully clothed on a padded table while the system scans one or more areas of bone. While DEXA uses x-rays, the radiation dose is less than during a chest x-ray.